Firework displays accompanied by music represent a welcome complement to your private or corporate celebrations, municipal festivals, and other events. You can celebrate during the day as well as the night, outdoors or indoors, in each season. Even if you decide at the last possible moment, we can still satisfy all your wishes. Each firework display is designed according to the event, location and audience to reach the highest possible level of excitement and entertainment. We never prepare two identical firework displays – each display is tailored exactly to suit our customer´s wishes and budget. For magicians, music bands etc. The price is determined according to the fireworks type and locality. The minimum sum of 15,000.- CZK is recommended. We would like to emphasize that the duration of the show is not necessarily a direct indication of the overall effect of the display. It is often better, especially with smaller budgets, to have a shorter “more compact” display with more going on at any one time to increase the show´s overall impact. 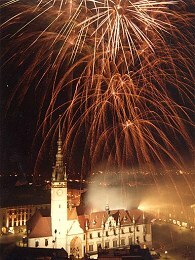 Firework displays can be combined with a fire show or special effects.